The Lego Ninjago Movie starts like a strobe light and ends like a night light. At first, it’s bright, loud, fast, and in your face—a constant barrage of visuals and sounds. Then it slows down considerably, focusing on the story and character development. One part is better than the other but neither is great, and, unlike Legos, they just don’t fit together. The third movie in Warner Bros. Animation’s Lego series, The Lego Ninjago Movie is the worst of the bunch by a fair margin. The product of three directors and six screenwriters, it’s nowhere near as smart as The Lego Movie nor as fun as The Lego Batman Movie. Instead it’s a relatively basic adventure about a high school student named Lloyd (Dave Franco) who is reviled because his absentee father Garmadon (Justin Theroux) is the most evil being on the planet. 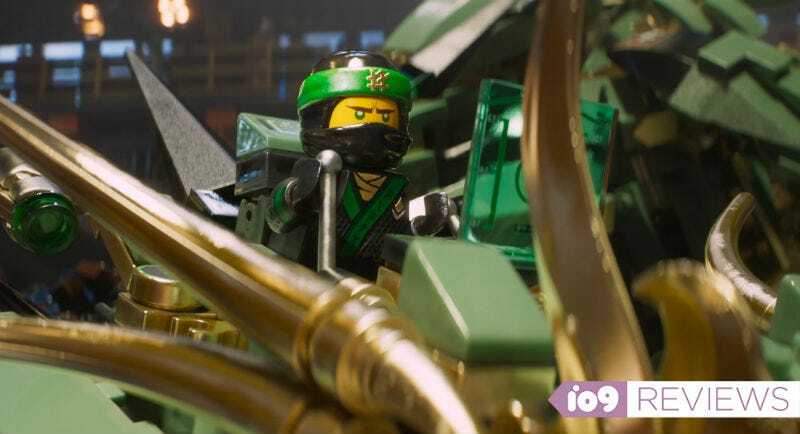 However, in secret, Lloyd is also one of Garmadon’s biggest adversaries, the leader of a secret ninja super team that constantly saves the city from Lloyd’s father. The Lego Ninjago Movie dives head first into this story, almost instantly revealing that this hated high school kid is also everyone’s hero. In theory, the film’s attempt to buck the predictable tropes of an origin story should be a good thing. But in Ninjago, it feels like you walked into the movie late and missed the first 20 minutes. First Lloyd is treated like crap, but then suddenly he’s an awesome ninja with a bunch of friends and cool robots. Something doesn’t quite compute. After about an hour of seemingly non-stop Lego action sequences, with all the characters acting super-exaggerated and the whole aesthetic more akin to a music video than a major motion picture, the film slows down considerably as Lloyd and the rest of the characters go off on a quiet adventure out of the city to solve a problem bigger than Garmadon. The movie shifts to being about Lloyd having long, deep conversations with the other characters, finding out who he is, why he is who he is, and everyone else discovering what their purposes are, too. This boring “getting-to-know you” stuff is actually better than the huge action sequences, mostly because it’s not being forced in your face with flashing bulbs. The film finally takes time to show who the characters really are, and gives them issues to struggle with. If these scenes had come before the action scenes, it would have given then them much more impact. But this arrangement doesn’t work. We don’t care when the stakes are high, and by the time we do care, the film is over. One surprising standout in all this is Dave Franco. While most of the other famous voice actors (which include Jackie Chan, Fred Armisen, Kumail Nanjiani, Michael Pena, Abbi Jacobson, and Zach Woods) all but melt into their roles, Franco’s exaggerated, expressive range works wonders in a setting like this. By the film’s final moments, you can feel his performance even through his plastic, yellow Lego face. And even though I hadn’t liked the movie much up until that point, I connected, even for a brief moment. There’s just a lot going on in The Lego Ninjago Movie. Some of it is fun and clever, but mostly it elicits eye-rolls and silence. Like the Lego toys the film is based on, all the pieces are there, they just needed to be assembled properly. Unfortunately, someone forgot to follow the instructions. The Lego Ninjago Movie opens September 22.